The Percival Proctor was a British radio trainer and communications aircraft of the Second World War. The Proctor was a single-engine, low-wing monoplane with seating for three or four, depending on the model. The Proctor was developed from the Percival Vega Gull in response to Air Ministry Specification 20/38 for a radio trainer and communications aircraft. The prototype aircraft first flew on 8 October 1939 and the type was put into production for the RAF and RN. The prototype was tested as an emergency bomber during 1940 but this idea was abandoned as the invasion threat receded. F. Hills & Sons of Trafford Park near Manchester built 812 Proctors of several marks between 1941 and 1945. The Proctor was initially employed as a three-seat communications aircraft (Proctor I). This was followed by the Proctor II and Proctor III three-seat radio trainers. In 1941, the Air Ministry issued Specification T.9/41 for a four-seat radio trainer. The P.31 - originally known as the "Preceptor" but finally redesignated the Proctor IV - was developed for this requirement with an enlarged fuselage. One Proctor IV was fitted with a 250 hp (157 kW) Gipsy Queen engine. This was used as a personal transport by AVM Sir Ralph Sorley but production models retained the 210 hp (157 kW) motor of earlier marks. At the end of the war, many Proctors of the early marks were sold on to the civil market. 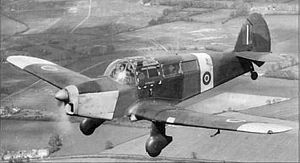 The Mk IV continued in service with the RAF until the last was withdrawn in 1955. In 1945, a civil model derived from the Proctor IV was put into production for private owner, business and light charter use as the Proctor 5. The RAF purchased four to be used by air attach�s. The final model of the line was the solitary Proctor 6 floatplane sold to the Hudson's Bay Company in 1946. Highly modified Percival Proctors were used in the film Battle of Britain as stand-ins for the Ju-87 Stuka. Three-seat communications aircraft, 247 built. Three-seat radio trainer, 175 built. Three-seat radio trainer, 437 built. Four-seat radio trainer with enlarged fuselage, 258 built. Governor-General's Flight RAAF operated one Proctor from 1945 to 1947. Belgian Air Force - 4 P.31C delivered in June 1947, one in October and one in March 1948. Operated as liaison aircrafts by No 367 Sqdn until 1950. Last withdrawn from use 1954. Royal Canadian Air Force - Used by a number of Canadian units in the RAF as a communications aircraft. Czechoslovakian Air Force in exile in the United Kingdom - One aircraft in service from 1944 to 1945. Royal Danish Air Force (RDAF) operated six P.44 Mk. III between November 1945 and November 1951. First aircraft operated by RDAF after World War II. Arm�e de l'Air - 18 Proctor IV received between September 1945 and May 1946 for use by ERN 703 (Radio Navigation School) in Pau. When the navigation training was transferred to Morocco in 1949 the Proctors were replaced by Ansons and 16 Proctors went to the civil market. Royal Netherlands Air Force - One Mk III was delivered in juin 1956, scrapped in february 1951, but the Koninklijke Luchtmacht also took delivery of 10 Proctor IV in juin 1947. Used as liaison aircrafts they were all scrapped in october 1953. Polish Air Force in Great Britain operated few aircraft (liaison duty). Example aircraft: DX190, LZ603. CTA - Companhia de Transportes A�reos operated one Proctor V (serial number AE1) between 1945 and 1950. Nevil Shute flew his Percival Proctor from Burma to Australia. Neville Shute Norway flew his Proctor from England to Australia and terminated the return flight in Italy, 1500 miles short of his goal, after a ground loop caused by a cross wind landing damaged the undercarriage. Italian bureaucracy delayed the importation of replacement parts and he was forced to return to England by commercial air. Proctor Mk III G-ALJF and Proctor Mk IV G-ANXR (RAF number RM221) are both airworthy and based at Biggin Hill. Proctor Mk I ZK-DPP and Proctor Mk Vs ZK-AQZ & ZK-ARP are airworthy and flying in New Zealand. Proctor III LZ766 at the Imperial War Museum, Duxford, Proctor IV NP294 at the Lincolnshire Aviation Heritage Centre, East Kirkby, G-AHTE at Clacton and Air Atlantique Classic Flight's G-AKIU are under restoration. Proctor Mk III G-AOGE has been at Biggin Hill for at least 20 years. The airframe has been completely restored over this time with much new wood and modern glue, but it has lain in the corner of one of the hangars for the last 5-6 years awaiting the finances to restore its engine. Proctor III Z7197 is on display at RAF Museum, Hendon. Another Mark III is on show at the RAAFAWA Museum, Bullcreek, near Perth, Western Australia.